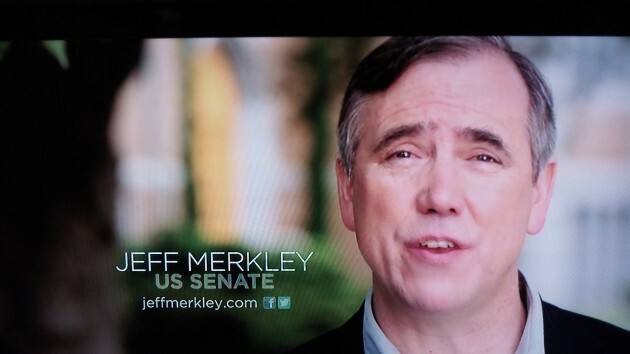 Sen. Jeff Merkley in one of his TV ads for re-election. It takes self-control these days not to yell at the TV, or to keep from throwing things. The politicians have showered the stations with money to run their campaign ads. The ads are all pretty bad — ranging from shallow to just plain dumb — but the one that gets me today is one by Jeff Merkley. Merkley has been in the Senate for six years without having advanced a solution to any of our problems. Oregon’s federal forests remain mismanaged and there’s no change in sight; the federal tax code is a mess that holds back our economy; the federal power system on the Columbia is under renewed attack from Merkley’s fellow Democrats and environmental activists in the face of inaction in the Senate or House to protect it. And so forth. That’s not’s not what he or any other politician is ever going to say. Instead, in this commercial Merkley says he was the first in his family to go to college. So what? The ad features several fresh-faced young people, all bragging about going to college. Then Merkley comes on and declares that’s why he stood up to Wall Street. (Wall Street is probably still shaking in its boots.) What the senator apparently did, according to the small print in the ad, is that he sponsored a bill related to college loans. College loans — that’s part of the problem, and making them easier to get does not solve it. If Merkley really wanted to stand up to anybody on this issue, he would protest the outrageous prices being charged for tuition and fees, and he would call out the universities for their lavish spending on layer upon layer of administration and other things unrelated to instruction and research. Merkley should be removed from office. I recently was with him as he visited Albany’s upscale MacDonalds. He had his phone to his ear the whole time–never said hello to anybody and was accompanied by 2 aids who did the same. Arrogant/out of touch with regular folks who has never done a thing for the taxpayers who support his lifestyle. You will never hear an honest word from him since he emulates our hologram president. Aren’t DVR’s great? I usually watch television on a “time delay basis” so that I can zap the commercials. It’s especially handy during election season. I have to agree with Ray Kopczynski’s comment about the duration of “election season.” Four to six weeks of intense campaigning seems adequate to tell the lies politicians tell to get elected, then promptly forget once elected (or so it seems). Regarding HH’s article, if Merkley didn’t mention things like being first in his family to go to college he’d have nothing to talk about. He hasn’t done diddly squat since the liberals in Portland got him elected. It’s too bad the Senators we send to Washington D.C. are statewide office holders because it would be more equitable if Portland could have (and vote in) “their” Senator, and the rest of the state could have our own. Rural Oregon has little voice in electing our Senators anymore.